On the corner adjacent to the Four Seasons Chinese Restaurant is the new Bonfire Brazilian Grill, but even during its recent past as Vaby’s Mediterranean Grill, the restaurant has never shaken its original name – the Keg. The boom in rooftop advertising in the area must have coincided with the opening of Kingsford Smith Airport’s third runway. ROCKY UPDATE: Aaaaand it’s Pancakes on the Rocks. Although in this case it’s a bit more like Pancakes 20km south-west of the Rocks. remember Viv they only had one or two bowsers! They purpose built that Chinese restaurant on the corner – it was originally the Bamboo Garden. It wasn’t the first Chinese restaurant though – there was the Bamboo Inn which was near Boian’s chemist and also Yens which was in that funny shop near the corner of KG Rd and Edgebastion – it has/had an opening into both streets. And the shop on the corner used to be a toy shop. The avalanche started after the Bamboo Inn opened – it was much more up market than the others. At one stage there was about 15 chinese restaurants. From memory, the servo that was next to the Four Seasons restaurant (ex Big John) and directly opposite the school was a Shell – it was the last one to go and is now a vacant block. I think the one where the Keg was built used to be a Golden Fleece? That was where we used to get off the 113 bus. Our family only ever went to the Bamboo Inn, which I think is still there. 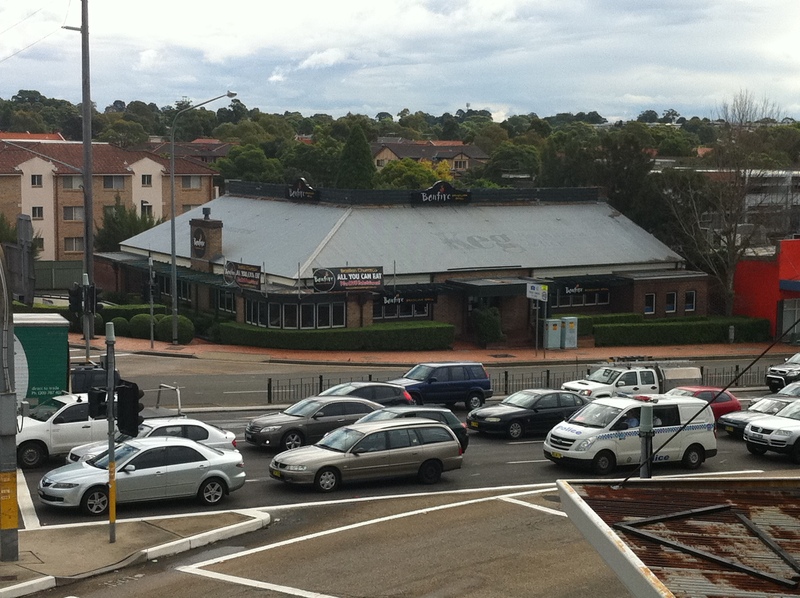 I recall the purpose built Chinese restaurant on the corner opposite the keg being built. On completion it seemed so up market and expensive. Hasten to add, it was probably for that reason that our family never went to it! Love your site! Have only just discovered it, and look forward to reliving more gems through your eyes. I lived in ‘Bevo’ in the 70’s. The former Keg site was a Mobil garage run by two brothers at the time. I actually worked at the former Shell garage next to the Four Seasons in the 80’s before it was demolished. My family was a regular at nearly all the local restaurants, and it was not until I was an adult that I ‘ate out’ outside the suburb. Paul, like you I’d never eaten at a restaurant outside of Bevo until I was an adult. Did you go to BHPS? No I didn’t, but thanks for asking Vivien. Apparently December 17 or 18th. I think that some of the staff there were a bit stale and left over from Vaby’s, which never seemed to really take off either. They have a branch at Penrith and the whole website appears to be off-line??? What do you think would do good in the area that is missing? Parking. That’s a major reason why restaurant after restaurant fails to ignite at this location. Pancakes on the rocks is opening soon on this site. Hope it goes well – i agree the parking is a big issue. I worked at the Keg when it first opened whilst at Uni, it would have been 1991 or 2. Not sure parking was a big issue as it had parking underneath. American style diners like this never really took off, Denny’s anyone? I think it’s to do with RSLs/ club bistros taking this end of the market in Australia. what are the former owners of the keg doing now?